This Reverse-Seared Rack of Lamb is an easy way to fool your friends into thinking you're a gourmet chef. Try pairing it with a delicious Mint Salsa Verde! 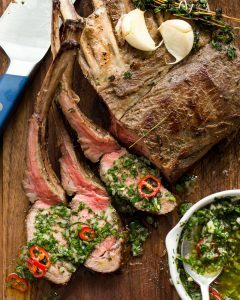 The post Reverse-Seared Rack of Lamb with Mint Salsa Verde appeared first on Primal Gourmet. The reverse-seared technique is my go-to method for cooking larger steaks, prime-ribs, and even entire racks of lamb like this one here. The process takes out nearly all of the guess work that is associated with the more common method for cooking coveted cuts of meat, which usually starts by searing and then finishing in the oven. Reverse-searing on the other hand, is pretty much exactly what it sounds like. Instead of searing the meat first and finishing it in the oven, you slowly raise the internal temperature of the meat in a low-temperature oven (anywhere between 225F and 275F) before searing it over very high heat. You can finish it over a grill or in a cast-iron skillet. For this rack of lamb I decided to sear it in a skillet and baste with some ghee, garlic and thyme. Though rosemary would make an excellent substitution! In theory, reverse-searing works similar to a sous-vide, which entails cooking foods in an oxygen-free environment (usually a vacuum-sealed plastic bag) under a temperature-controlled water bath. The heat of the water is regulated to precise degree by a circulator. Until recently, sous-vide circulators were very expensive. More affordable options are now available but I have yet to bite the bullet and purchase one for myself. The practical applications of the reverse-seared technique is actually very far-reaching. You can do this with a variety of meats. Not least of which is a beautiful rack of lamb. In terms of flavours, I like to keep things simple. Marinating the lamb in a mixture of garlic, thyme, olive oil, and lemon juice will impart a lot of flavour with minimal effort. As mentioned, fresh rosemary can be used instead of the thyme. I just decided to go with what I had on hand. 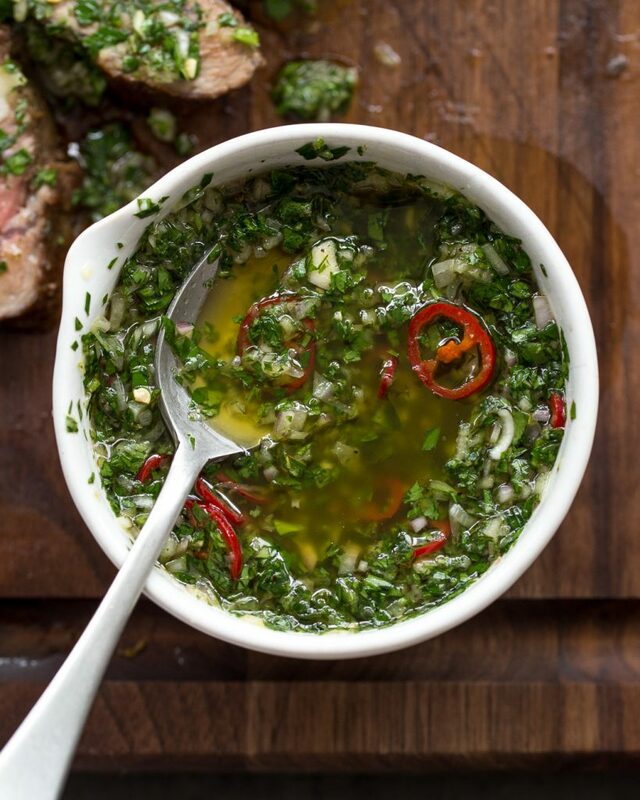 To sauce things up, I decided to make a quick-and-easy mint salsa verde. This is nothing like the mint jelly I despised eating growing up. It’s packed with finely chopped fresh mint, parsley, garlic, shallot, red chili pepper, olive oil, lemon juice, salt and pepper. The secret weapon is the addition of a tiny amount of maple syrup. Just a teaspoon of the stuff is enough to completely change the balance of flavours. However, if you are on a round of Whole30, feel free to omit the natural sweetener altogether. It will still be delicious! Meat Thermometer. This really won’t work unless you have a meat thermometer. For accuracy, I recommend getting a digital one like this Lavatools model. It’s affordable and accurate. Unless you’re cooking in a professional setting, there is absolutely no need to get an expensive one. You’re better off spending that extra coin on a grass-fed, organic rack of lamb. A Cooling Rack + Sheet Pan Combo: You want air circulating around the meat so that it cooks evenly on all sides. This is easily achieved by placing it on an oven-safe cooling rack set over a sheet pan. Ideally, you want to make sure that the size of the cooling rack corresponds to that of the baking sheet beneath it, like this one. This will help with easy clean up because when your done cooking you can simply fill the baking tray with hot, soapy water and submerge the inverted cooling rack in it to ease off grease and any hardened pieces of meat/fat. A Carbon-Steel of Cast-Iron skillet: If you don’t have a grill to sear the meat after it has slowly roasted in the oven, the next best thing is a carbon-steel or cast-iron skillet. I always recommend this Lodge model for cast-iron because it’s inexpensive and really is the best bang-for-your-buck pan you can buy. For carbon-steel, Made In has recently released a great one that I’ve been using for a few months now. 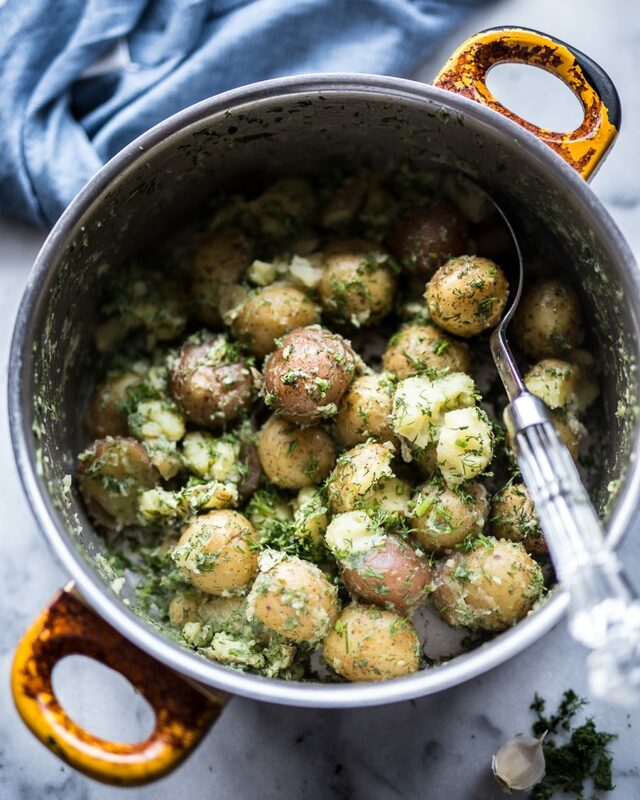 To a small bowl, add chopped thyme, grated garlic, lemon juice and EVOO – stir to combine. Alternatively, add these ingredients to a mortar and pestle and bash until formed into a paste. Trim lamb of any excess fat or silver skin. Pat dry with paper towel and season all sides liberally with salt and pepper. Transfer lamb to a zip-top bag set within a bowl and pour in the marinade. Seal the top of the bag and gently massage the marinade around the lamb. Squeeze out all of the air from the bag and seal it tight. Transfer to refrigerator and let marinate 4 hours to overnight. 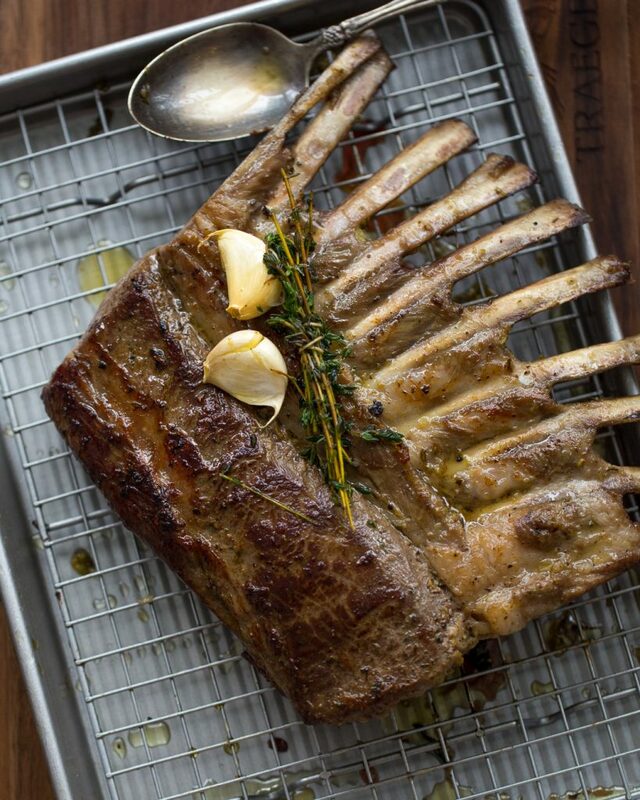 Place the rack of lamb bone-side down on a cooling rack set over a sheetpan. Transfer lamb to oven and roast 30-45 minutes or until internal temperature of the thickest part of the lamb reads *125F on a digital thermometer (*for medium-rare to medium centre). Cooking times vary depending on thickness of meat and efficiency of oven. Meanwhile, prepare salsa verde by adding all ingredients to a mixing bowl and stirring to combine. Taste for seasoning and adjust as required. Set aside at room temperature. When lamb is cooked to temperature, preheat a cast-iron or carbon steel pan over medium-high heat. Add ghee, thyme sprigs wrapped in twine and smashed garlic cloves to the pan. Carefully lay rack of lamb in the pan, top-side down first. Place garlic and thyme on top of lamb and sear meat 2-3 minutes, basting constantly with melted ghee. Flip and continue basting. Transfer seared lamb to a cutting board and let rest 5 minutes before carving. Serve with Mint Salsa Verde. 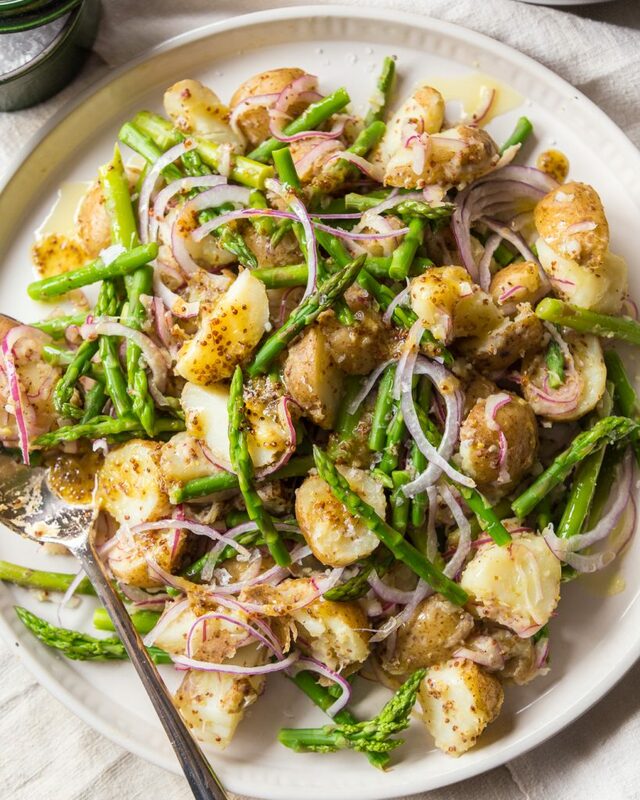 Looking for some easy, delicious and healthy side dishes to make this Easter or Passover? Try some of these crowd pleasers! The post 10 Whole30 and Paleo Side Dishes to Make this Easter and Passover appeared first on Primal Gourmet. 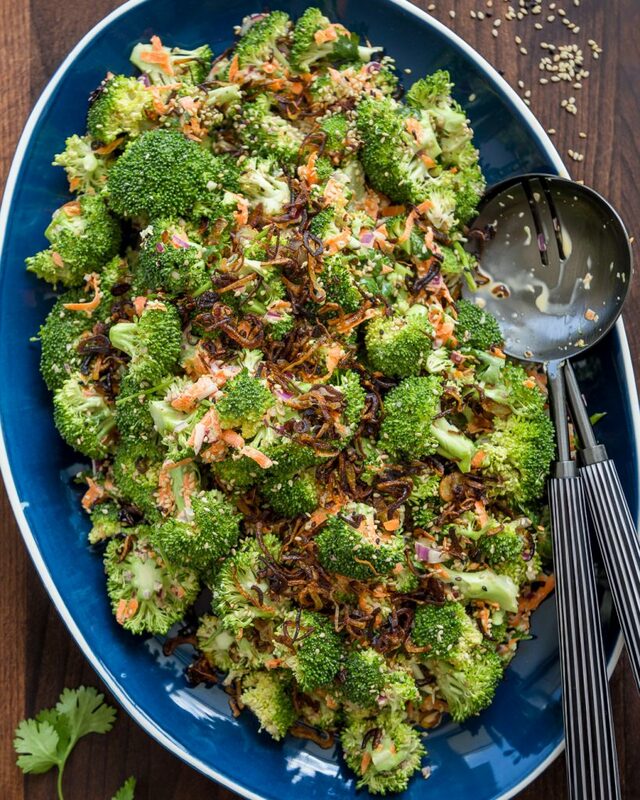 Looking for some easy, delicious and healthy side dishes to make this Easter or Passover? Or maybe you just need some ideas to get your creative juices flowing? 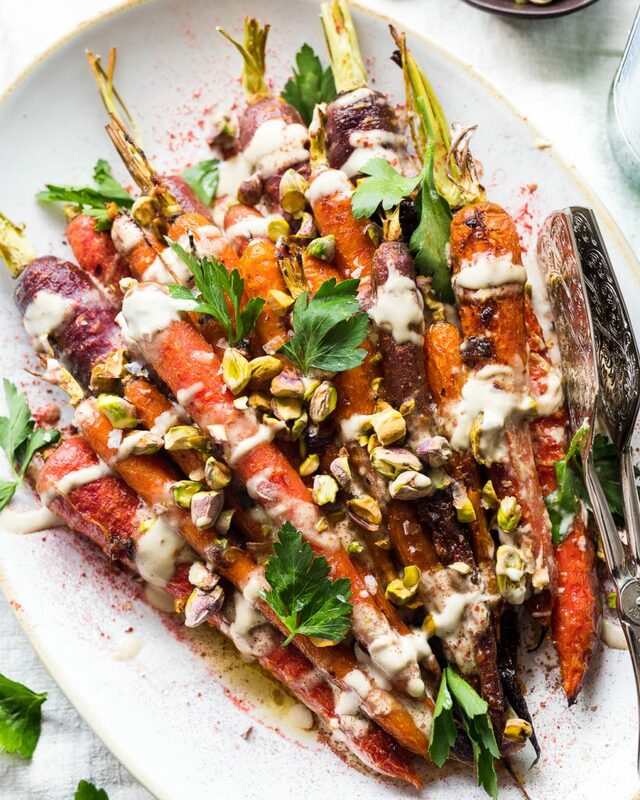 Either way, feel free to use, peruse or build off of the following crowd-pleasing, vegetable-focused recipes to create a feast for your family and friends. 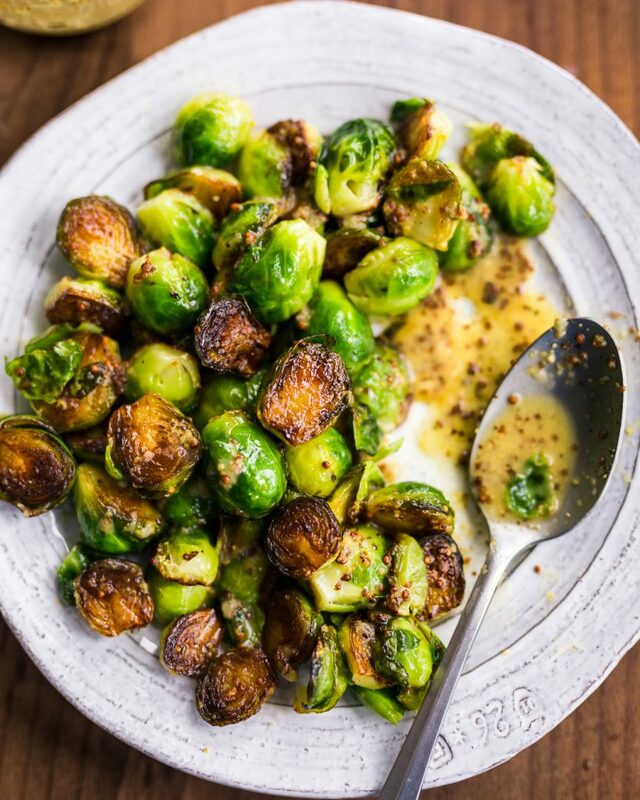 You’ll find some tasty carrots, perfectly-cooked Brussels sprouts, green beans that make your mouth sing and a bunch of other delicious options. Most are Whole30, some are Paleo, all are delicious! Scout’s Honour. These Pan-Roasted, Shwarma-Spiced Chicken Thighs are quite tasty! So tasty, in fact, that you may find yourself making them more than twice... a week! 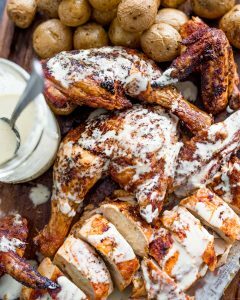 The post Pan-Roasted, Shwarma-Spiced Chicken Thighs – Whole30, Paleo appeared first on Primal Gourmet. Last night I shared a step-by-step demo of these Pan-Roasted, Shwarma-Spiced Chicken Thighs on my Instagram stories and foolishly did so without an accompanying written recipe. Much to my surprise, so many people (at least 3) requested a more detailed breakdown of ingredients, measurements, temperatures and times, all of which I am more than happy to provide! Not pictured here, but enjoyed as part of yesterday’s dinner and shown in the accompanying video, are a quick-and-easy chopped salad and an equally fast-and-simple (<– me demonstrating my expansive vocabulary and knowledge of synonyms). I also mixed together some Tunisian Harissa paste with some water to create a very tasty hot sauce of sorts. Harissa is becoming more an more popular these days but if you’ve never tried it, it’s a delicious, herbaceous and slightly bitter chili paste. Altogether, it was a delicious, easy, light-yet-filling dinner that came together in around 20 minutes. 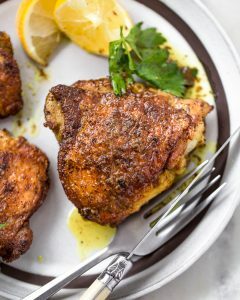 Similar, yet different, to these pan-roasted chicken thighs is my Whole30 Bootleg Chicken Shwarma, which uses the same spice rub but involves thinly-sliced boneless, skinless thighs quickly seared in a hot skillet. Pan-Roasting is a cooking technique that involves searing something (protein or even a vegetable) on the stovetop and then gradually finishing the cooking in the oven through indirect heat. It works great on thicker cuts of meat, such as bone-in, skin-on chicken thighs, large steaks, pork chops, racks of lamb, etc., because it allows you to develop a very crispy crust on the exterior without running the risk of burning it before the inside has had a chance to finish cooking. For thinner cuts, such as butterflied chicken breasts, for example, pan-roasting may not be necessary since you can simultaneously develop a crust and finish cooking the meat entirely on the stovetop. Instead, you would simply pan-sear (which doesn’t involve the oven). In closing, the common denominator for things you want to pan-roast is that they would benefit from the development of a crust. You will notice that I used a stainless-steel skillet in the video. Lets’ not mince words here, it’s actually a Hestan Nanobond Titanium skillet but that’s neither here nor there. Any who, I got so many questions (again, at least 3) about why I was using stainless-steel (for argument’s sake let’s just go with it) as opposed to cast-iron. The answer is simple: I couldn’t fit 6 chicken thighs in my cast-iron skillet. The point is you can use any heavy-bottomed skillet (cast-iron or stainless-steel) that is oven-safe. Make sure the handle material is oven-safe and the materials are appropriately temperature rated. In this case, you’re only cooking at 375F, so most pans will be OK.
FAQ: what if I don’t have an oven-safe pan? Can I sear in a skillet and transfer to a baking vessel like a sheet pan or casserole? Answer: Sure you can! If you’re cooking a steak or chop or something like that, be sure to brown both sides before transferring to oven. In the case of the chicken thighs, I am only worried about getting the skin crispy so I transfer to oven immediately after flipping in the skillet. In other words, I don’t bother browning the second side of the thighs because the hot pan and heat from the oven will do that work for me. Preheat a stainless-steel or cast-iron skillet over medium-high heat for at least 5 minutes. Add oil and let heat 60 seconds. Carefully lay chicken in hot oil skin-side down and cook 5-6 minutes or until golden brown. Flip chicken and transfer to oven. Cook 10-12 minutes or until internal temperature of chicken registers 165F on a digital meat thermometer. Serve with chopped salad, tahini and harissa. In possession of leftover chicken? Try tossing together a quick-and-easy Chicken Cobb Salad. And don't forget the bacon, because it's delicious. 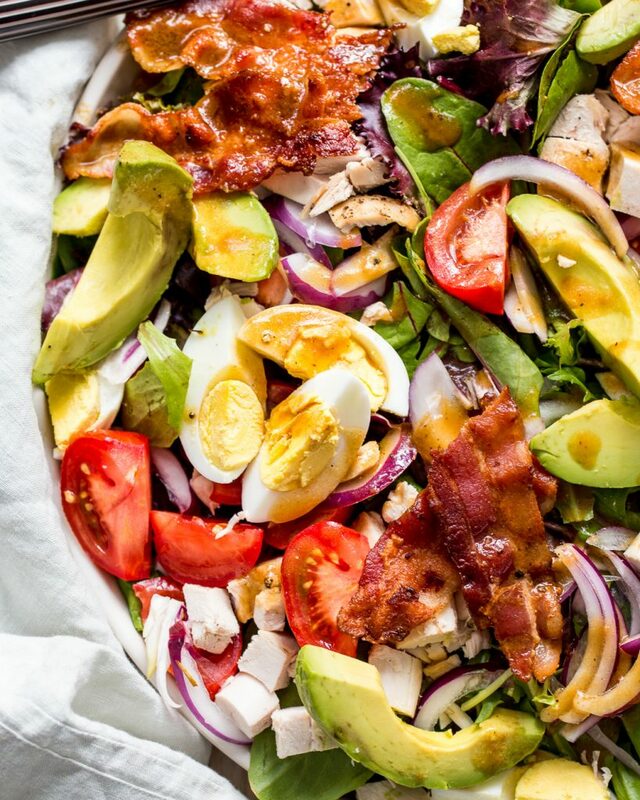 The post Chicken Cobb Salad – Paleo appeared first on Primal Gourmet. If you’re anything like me, you often find yourself in possession of some leftover roasted chicken. I’m talking at least once a week and specifically the white meat. It’s a good problem to have, don’t get me wrong. In fact, I’d be lying if I said that I don’t purposefully set some chicken breast aside so that I can craft a delicious Chicken Cobb Salad the following day. OK, fine, sometimes it takes me a couple of days before I get around to the salad but that’s only because I like daily variety. 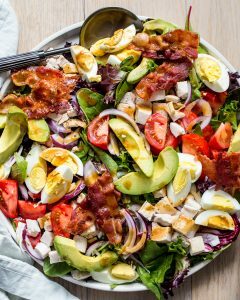 The point is, this Chicken Cobb Salad is as much a staple in my household as my Emergency Roast Chicken. If you haven’t tried it, it’s great if you’re in a pinch and need to get an easy and delicious meal on the table. If, however, you don’t have any leftover chicken but still have a hankering for a tasty Cobb Salad situation, feel free to substitute a lean protein of choice. Ideas include, but are not limited to, freshly-grilled chicken (not leftover), grilled steak, grilled shrimp, grilled salmon, roast salmon, etc. On that same note, I would also open the door to a variety of other salad toppings. If you want to add some grated carrots, go crazy! Cucumbers overloading your crisper drawer? Chop ‘em up and throw ‘em in! In the mood for blue cheese? Heck, I’m not gonna stop you! This, of course, brings up a very, very serious question: “what makes a Cobb Salad a Cobb Salad? Is it the ingredients? For instance, does a Cobb Salad have to include blue cheese? What about corn? Avocado? Bacon? BACON??? Do all the ingredients need to be diced? Arranged into separate sections on the plate? I’m not sure I will ever have the answer but I can tell you one thing, I love all shapes and sizes of this delicious salad and now that the weather is warming up I find myself craving them more and more! In possession of leftover chicken? Try tossing together a quick-and-easy Chicken Cobb Salad. And don’t forget the bacon, because it’s delicious. Add all vinaigrette ingredients in a small mixing bowl and whisk until emulsified. Place bacon on a cold non-stick frying pan, set over med-high heat and cook until crispy (flip once). Transfer cooked bacon to a plate lined with paper towel to absorb excess grease. Arrange greens, tomatoes, onion, avocado, eggs and bacon on a large serving platter. Dress with vinaigrette and serve. To take some of the edge off the onions, try rinsing them under some cold water. Big, bold, spicy flavours like allspice, scotch bonnets & thyme come together in this delicious & Whole30 Spicy Oxtail Stew with Sweet Potato. 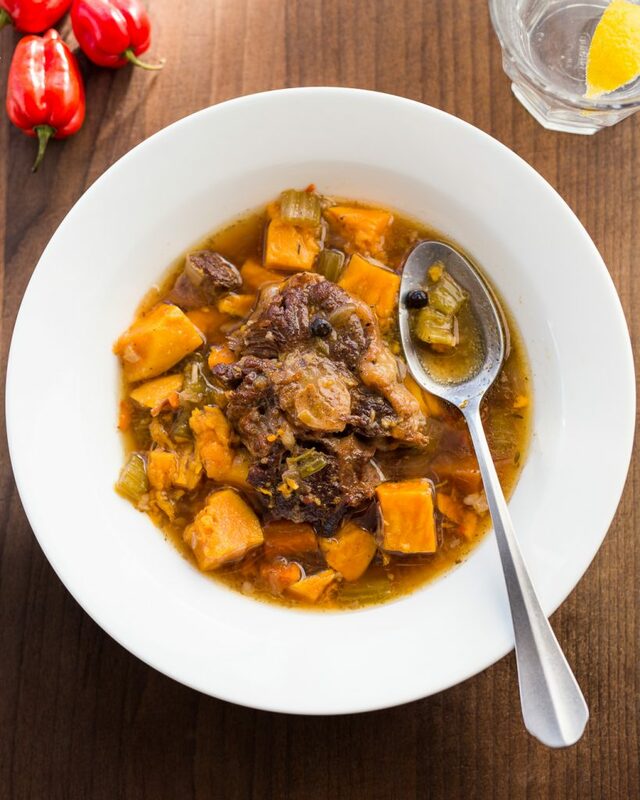 The post Spicy Oxtail Stew with Sweet Potato – Whole30, Paleo appeared first on Primal Gourmet. Oxtail stew is a personal favourite of mine. It’s undoubtedly my go-to order when I’m out for Jamaican food. 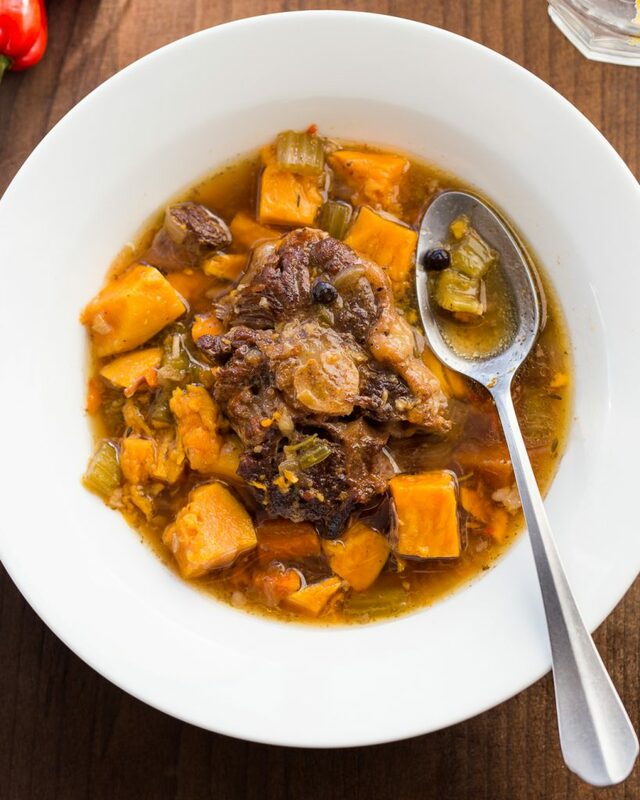 This spicy version is inspired by the many oxtail stews I’ve eaten throughout Toronto, but incorporates the addition of sweet potato to round it out as a full meal. I also love to serve it alongside some creamy cabbage coleslaw! The flavours from the allspice, thyme and scotch bonnets marry beautifully together in the spicy broth that is naturally thickened by the collagen-rich oxtails. As the title suggests, this dish is intended to be spicy so if that’s not your thing maybe try dialling back the amount of scotch bonnet in the recipe. If you’ve never cooked Oxtail before, this just might be the recipe for you. Despite the fact that it takes a very long time to prepare, oxtail is straightforward enough for anyone to follow and is entirely worth the effort. You can also try using oxtail in my mother-in-law’s Romanian beef soup (Ciorba de Vacuta). I think that the best flavour comes from braising the stew in a Dutch oven. There’s something to be said for doing things the old-fashioned way here. It gives the stew more time to develop in flavour by allowing the sauce to reduce and concentrates. In fact, like most stews, this tastes better the next day after a night of hanging out in the fridge. The tradeoff, of course, is a 4.5 hour cook time. 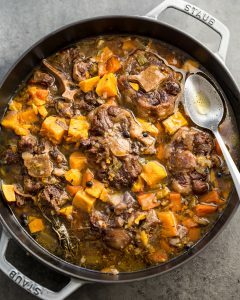 Can I Make Oxtail Stew in the Instant Pot? If you would like to speed things up, you can make this in an Instant Pot. If so, you will need to cut the liquid added to the pot by half to account for the fact that the sauce will not reduce under pressure. Cooking time in the Instant Pot is a mere 90 minutes under high pressure. You can always reduce the sauce after the oxtail is done cooking, but this needs to be factored into the total cooking time as well. Give it a go and let me know what you think in the comments below. Heat 2 tbsp avocado oil in a Dutch Oven over med-high heat. Pat oxtails dry with a kitchen towel, season with salt and pepper and, working in batches, brown on all sides (approx. 10-15 min total). Transfer browned oxtail to a plate and set aside. To the pot, add onion, carrots, celery, scotch bonnets, ginger and garlic. Season with a pinch of salt and cook 2-3 min and scrape off any brown bits that have formed on the bottom of the pot with a wooden spoon. Add beef stock, allspice and thyme. Return the oxtails back to the pot – they should be nearly submerged. If required, add stock or water. Bring liquid to a low boil, cover with a lid and place in the preheated oven. Cook for 4.5 hours stirring once every hour or so. After 4.5 hours, add in the sweet potato and return to the oven for another 20-25 minutes. 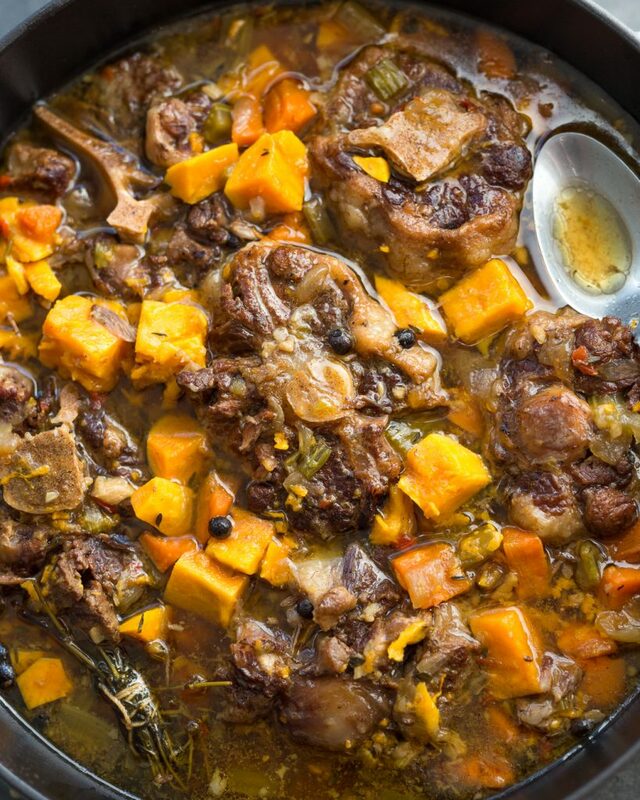 The stew is ready when the meat on the oxtails falls off the bone and the sweet potatoes are fork tender. Taste stew for salt and pepper and adjust accordingly. Ladle into individual bowls and serve with a tall glass of water! 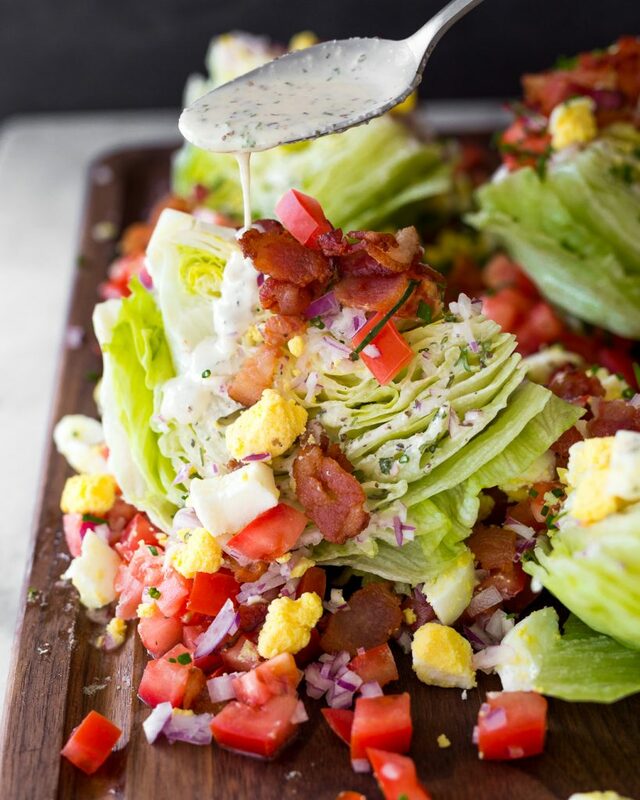 The post Classic Wedge Salad with Whole30 Ranch Dressing appeared first on Primal Gourmet. 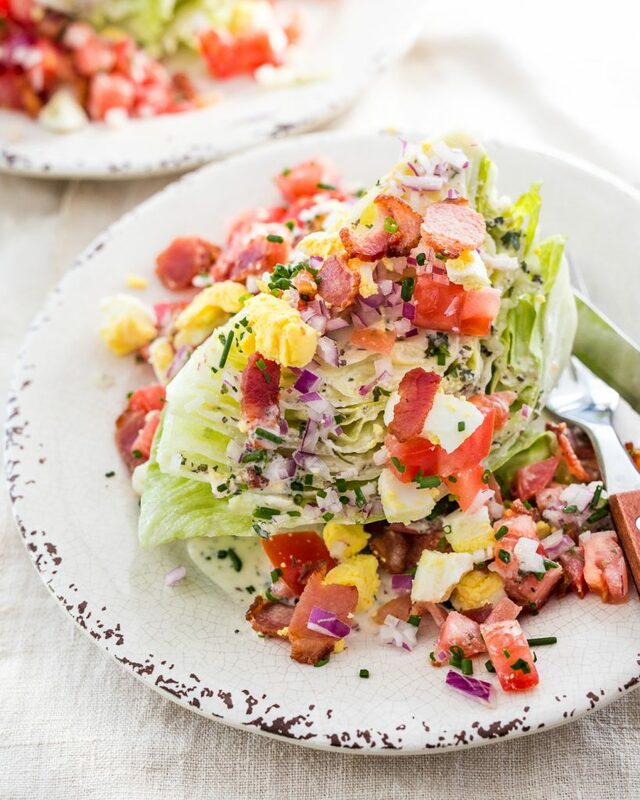 Thanks to a quick-and-easy Whole30 Ranch Dressing, this Classic Wedge Salad is filling without weighing you down! It can be served as an appetizer, as is, or paired with a lean protein and enjoyed as an entrée! 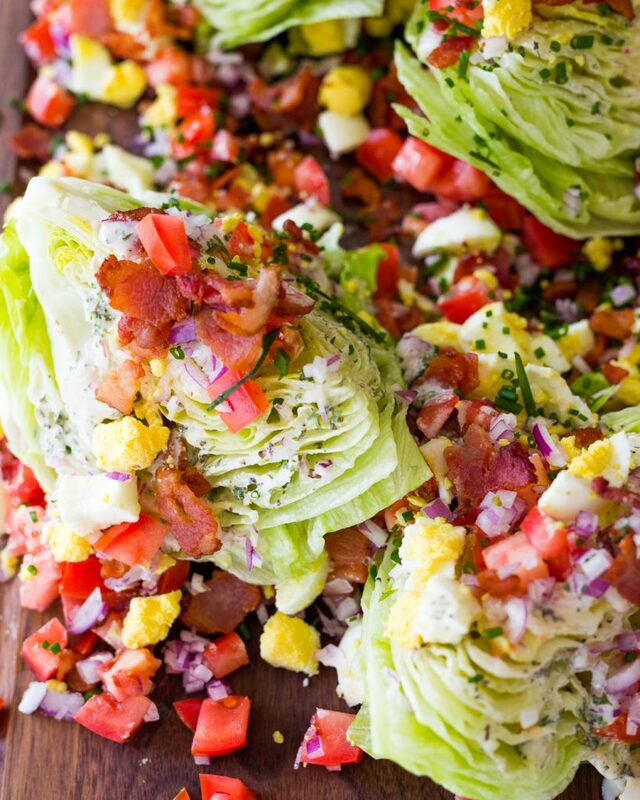 I don’t know about you, but I love me a good Wedge Salad! First and foremost, I think iceberg lettuce is supreme underrated. Sure, it’s not as nutritionally dense as its dark, leafy green cousins, but what it lacks in vitamins it makes up for in crunch. I love that this Wedge Salad puts iceberg on a pedestal and pays it the proper respect it deserves! 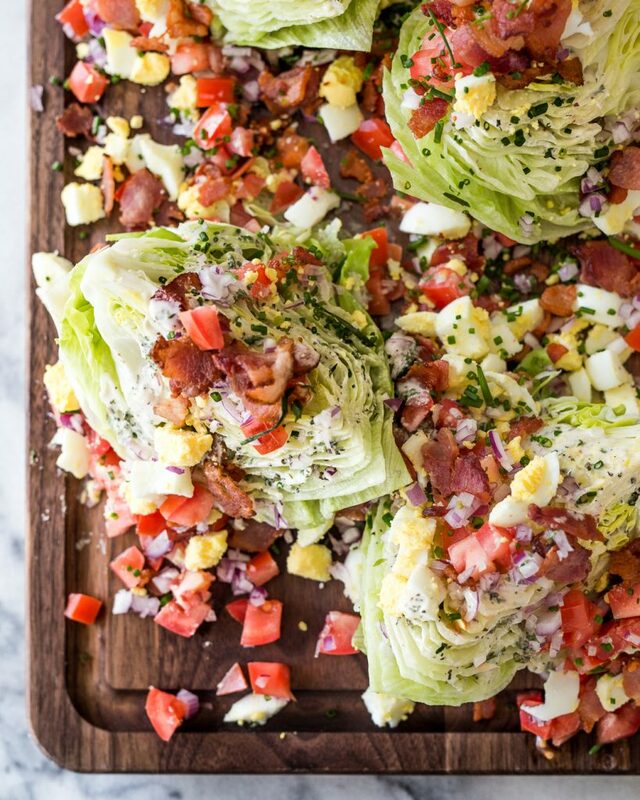 Aside from the lettuce, Wedge Salad is all about the toppings. In this “Classic” version, I keep things simple with some chopped tomatoes, red onion, hard-boiled eggs, crispy bacon and fresh chives. However, the world is your oyster, friends. You can try topping it with grilled chicken, shrimp, flank steak, fried shallots, toasted walnuts, or even some lobster! 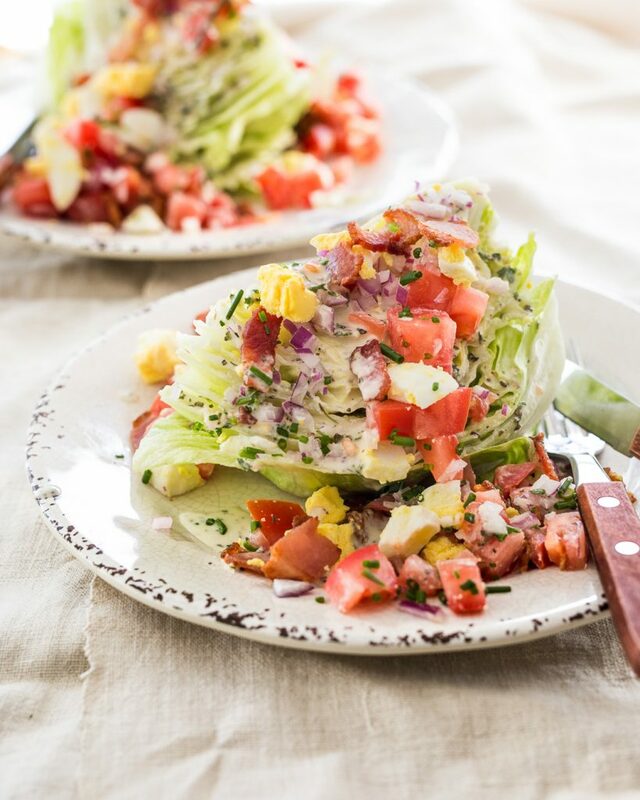 To be fair, the “Classic” pairing for a Wedge Salad is a thick and creamy, blue cheese and buttermilk dressing. But I think there’s something to be said for this Whole30 Ranch. Not only is it easy to make (it’s just a matter of whisking together some wet and dry ingredients), but it’s also very tasty! It’s creamy, tangy and flows through all of the folds in the iceberg wedge making each bite as delicious as the next. You would be hard-pressed to tell it was dairy-free! 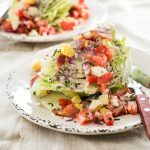 I hope you’ll give this Classic Wedge Salad a try! If you do, let me know how it goes and be sure to share on social by tagging me, @primal_gourmet, so that I can see your creations! Add all dressing ingredients to a small mixing bowl and whisk until smooth and combined. Cover and refrigerate at least 30 minutes before serving. Bring a saucepan of water to a rolling boil. Slowly submerge eggs using a slotted spoon. Cook eggs exactly 12 minutes. Drain water and fill saucepan with very cold water to shock eggs and stop the cooking process. Let eggs cool 5 minutes before peeling and roughly chopping. Add sliced bacon to a cold, non-stick skillet. Set over medium-high heat and cook until bacon is crispy and golden brown (approximately 6-8 minutes). Transfer cooked bacon to a plate lined with paper towel to absorb excess fat. *Tip: Rendered fat can be transferred to a sealable container and refrigerated up to 5 days for other cooking purposes, like fried eggs. Arrange iceberg lettuce wedges, cut-side up, on a large board. Drizzle with Whole30 Ranch Dressing, top with tomatoes, onions, chopped eggs, bacon, and chives. Serve immediately. 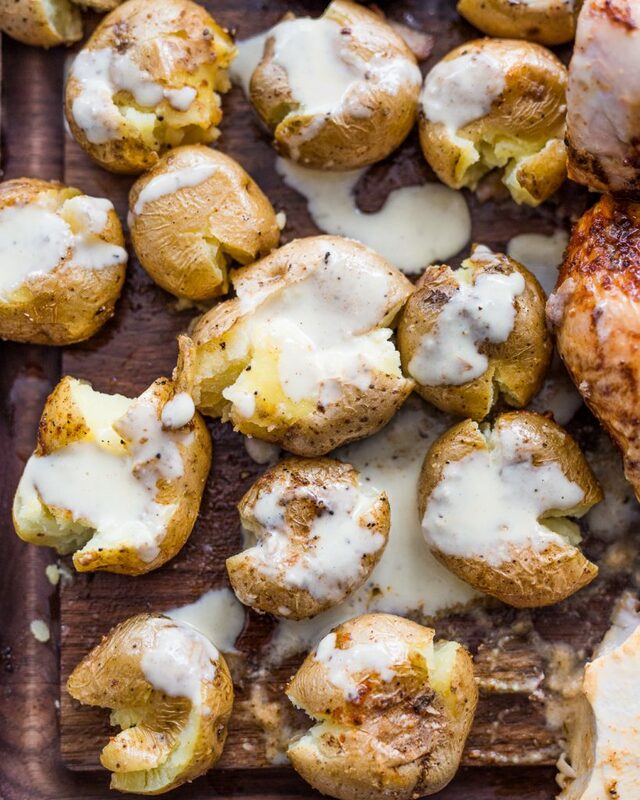 This Traeger Smoked Chicken and Potatoes is the stuff summer dreams are made of. Try smothering it in some Alabama White BBQ sauce, if you dare! 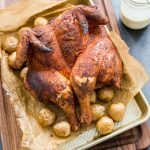 The post Traeger Smoked Chicken and Potatoes – Paleo appeared first on Primal Gourmet. 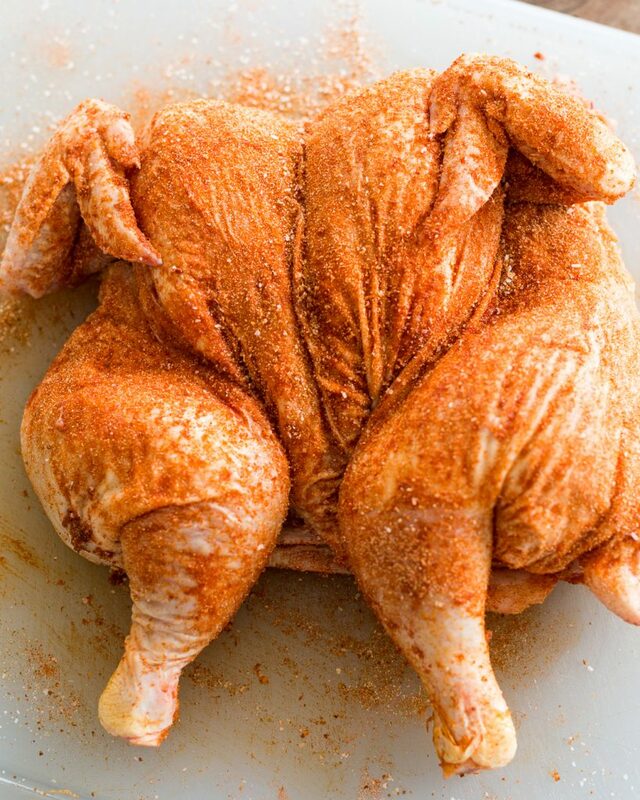 The chicken is rubbed in some hot sauce and dusted in a quick-and-easy homemade spice rub. First, I smoke the chicken on the Traeger at 225F for 30 minutes to allow some wood flavour to infuse the meat. It’s then finished at 400F so that the chicken skin gets nice and crispy. Just before it’s done cooking I brush the smoked chicken with some melted ghee (or spray it with this 4th & Heart Ghee Oil Spray), which adds amazing flavour and a beautiful, glossy coat. Since the grill was already running, I also threw on a tray of creamer potatoes simply seasoned with salt and pepper and tossed in EVOO. You could just as easily grill some veggies of choice! While the chicken and potatoes were cooking, I also made a super easy and flavourful Whole30 Alabama White BBQ Sauce. I wanted something tangy that would balance the sweetness of the coconut sugar in the spice rub. Needless to say, it didn’t disappoint and will be a regular addition to my summer cookouts! I don’t know why it’s taken me this long to make some! If you aren’t familiar with Traeger, they make incredible Wood Pellet Grills. Unlike conventional propane or natural gas grills, which use direct heat, Traegers operate on 100% natural, food-grade wood pellets and use an indirect heating method. The easiest way to understand how Traegers work is to think of them as outdoor, electrical convection ovens that use 100% all-natural, food-grade wood pellets. In a nutshell, an auger feeds pellets into a central fire pot that combusts the pellets. A fan then circulates air throughout the cooking chamber and heats it according to the temperature setting you desire. Everything is fully automated, which means you don’t have to nurse a fire or guesstimate how much fuel to add. Simply add the pellets to the grill hopper, adjust the heat and cook your food. As if it weren’t easy enough, Traeger just redesigned their entire lineup to include standard WiFire technology (along with improved drivetrains and insulation), which allows you to control the heat with your phone. I was a skeptic of the added tech at first but the ability to have access to your grill from anywhere is unbelievably useful, especially if you are cooking cuts of meat that take upwards of 8 to 10 hours in the middle of winter! It’s a complete game changer! Just about anything you make in an oven can be done on a Traeger, with the added benefit of wood flavour. The possibilities are truly endless, oftentimes more flavourful and it’s a great excuse to cook outside! I realize this all sounds like an advertisement, but it’s not. I 100% love these grills and wouldn’t hesitate for a moment to recommend them. My love was further cemented from having visited their HQ last week, meeting their team and learning just how much thought goes into their grills. If you don’t own a Traeger, you can still make this recipe! As mentioned, a Traeger works just like an oven. The only differences are you won’t need to smoke the chicken at a low temperature first and you can add the potatoes right away. Simply place the chicken on a roasting tray lined with parchment paper and cook at 400F until the thickest part of the thigh registers 155F on a digital meat thermometer (approximately 55-60min). Then, baste the bird with the rendered juices and cook an additional 8-10 min or until the same part of the bird registers 165F. Run the start-up cycle on your Traeger. Once complete, preheat grill to 225F. Half-spatchcock chicken by cutting along one side of the backbone with a sharp knife or pair of kitchen shears. Place bird on cutting board, breast-side up, and use your hands to flatten. Pat dry with paper towel. Add a few dashes of hot sauce all over bird and massage to coat. Careful, the bones in the carcass are sharp and can prick you. 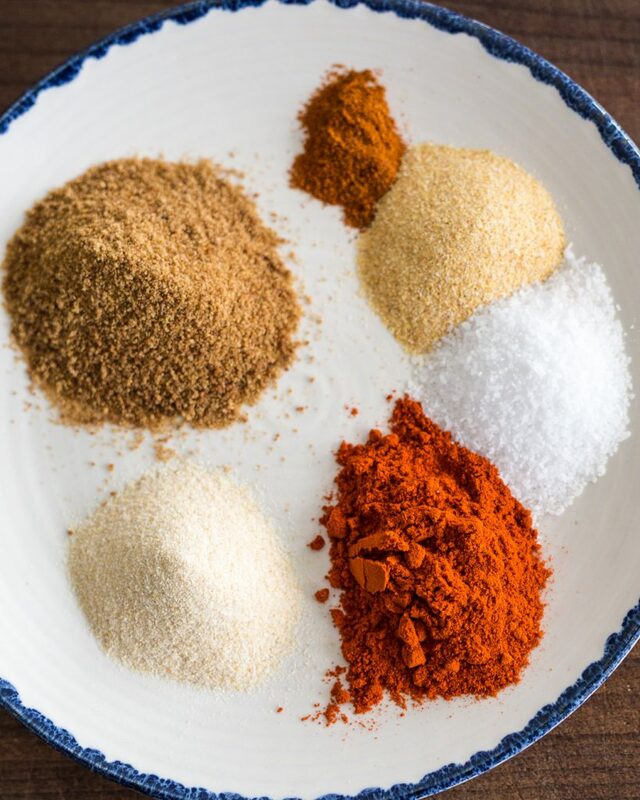 To a small mixing bowl, add coconut sugar, onion powder, garlic powder, paprika, cayenne pepper and kosher salt. Stir spices to combine. Liberally season all sides of the bird, including any nooks and crannies. 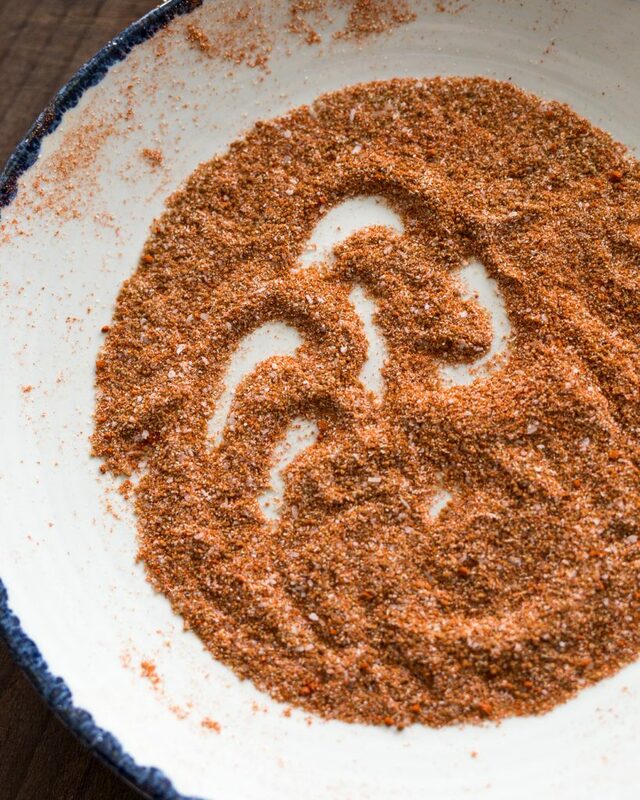 If there is leftover spice rub, place in a sealable jar and save until next time. Lay seasoned chicken skin-side up in the centre of the preheated Traeger. Close lid and smoke at 225F for 30 min. 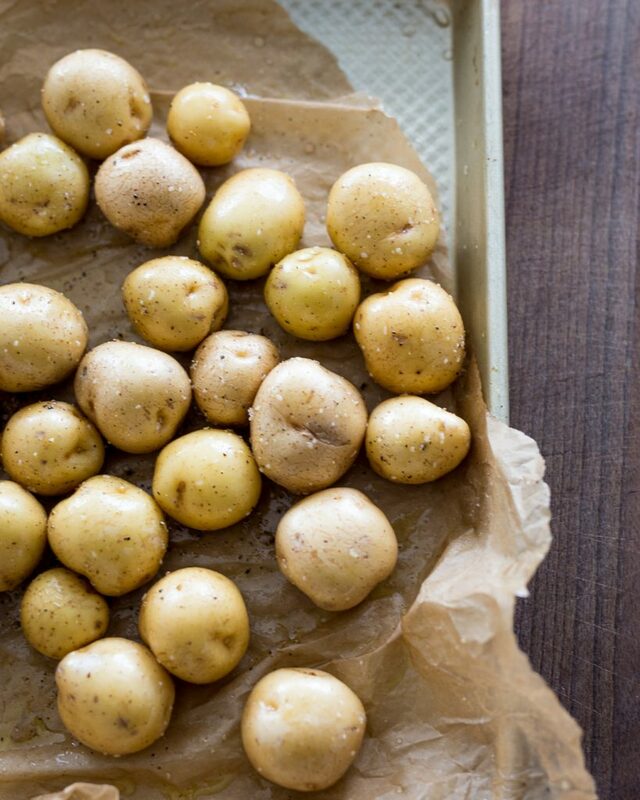 Meanwhile add potatoes to a sheetpan lined with parchment paper. Toss to coat in EVOO, salt and pepper. Raise heat of Traeger to 400F, add potatoes on sheet pan, close lid and cook until thickest part of chicken thigh registers 155F on an instant read thermometer (approximately 60 min). 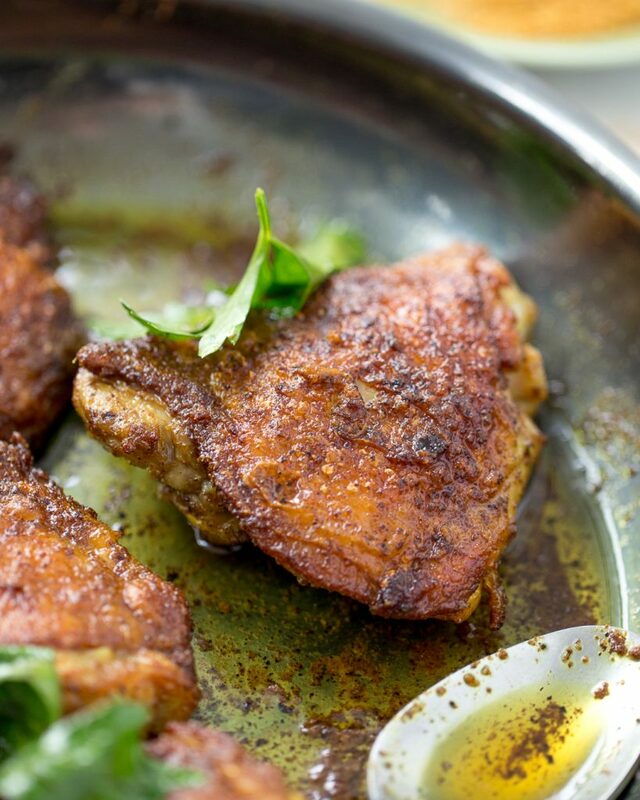 Brush chicken with melted ghee, close lid and cook until same part of thigh registers 165F (approximately 10-12 min). 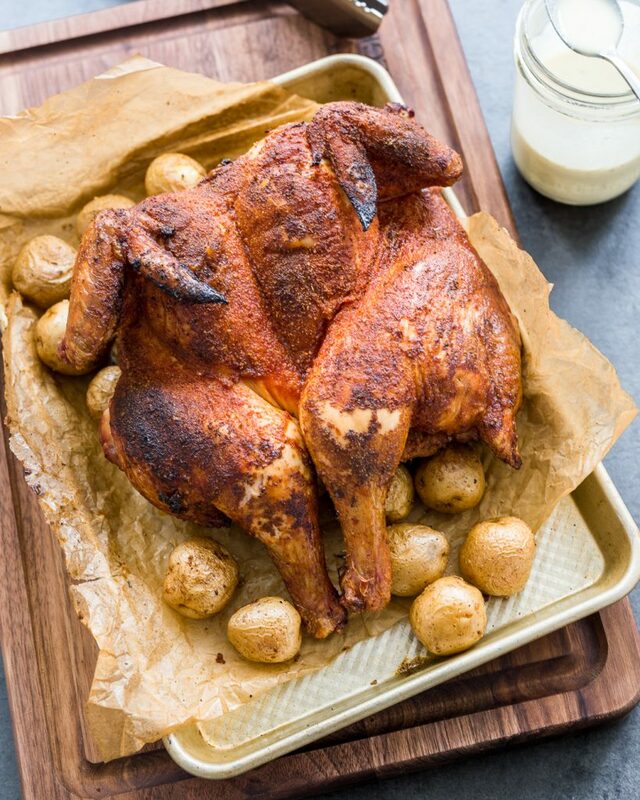 Transfer smoked chicken to a cutting board and let rest at least 10 min before carving. Serve with potatoes, side salad and Alabama White BBQ sauce. *See here for Whole30 Alabama White BBQ Sauce recipe. 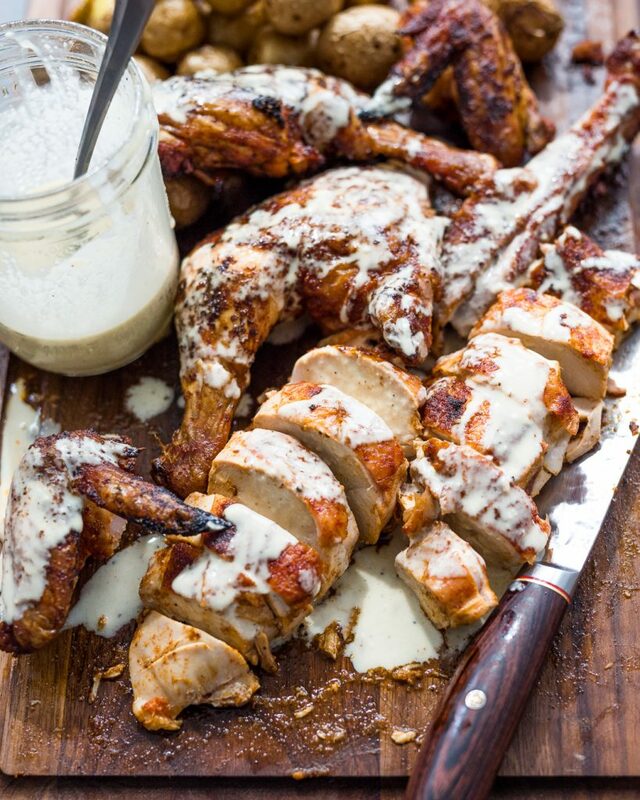 Alabama White BBQ Sauce is a creamy, tangy and incredibly delicious accompaniment to your favourite grilled meats! Oh yeah, it's Whole30 and Paleo! 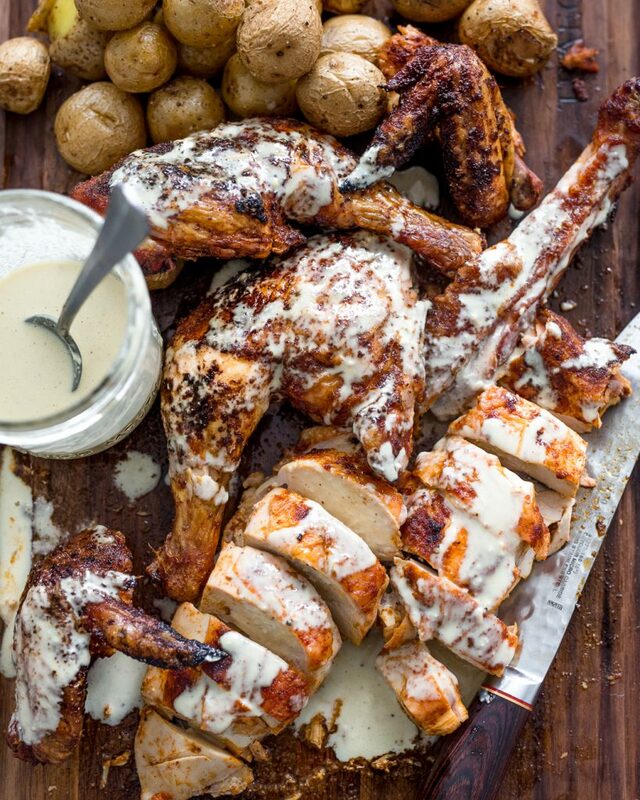 The post Alabama White BBQ Sauce – Whole30 appeared first on Primal Gourmet. 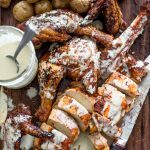 This Alabama White BBQ Sauce isn’t just quick-and-easy, it just so happens to be Whole30 and Paleo compliant! 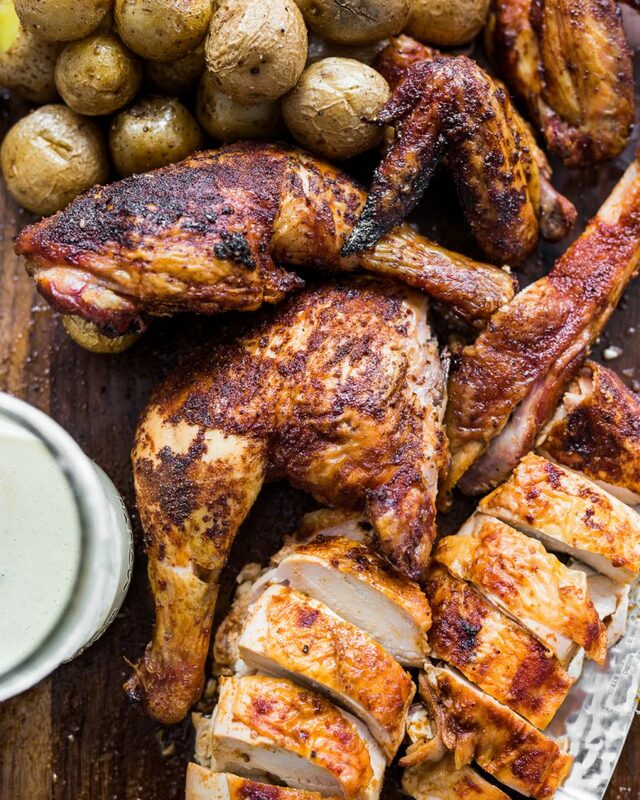 It goes great with grilled meats, like this Traeger Smoked Chicken and Potatoes. Add all ingredients to a mason jar or small mixing bowl and stir to combine. Cover and refrigerate at least 30 minutes before serving. *Will keep for up to 5 days in the fridge. Lomo Saltado is a delicious, Peruvian stir-fry made from beef tenderloin, onions, tomatoes, aji amarillo (a yellow chili pepper) and french fries. That's right! French Fries! The post Whole30 Lomo Saltado appeared first on Primal Gourmet. Lomo Saltado is a delicious, Peruvian stir-fry made from beef tenderloin, onions, tomatoes, aji amarillo (a yellow chili pepper) and french fries. That’s right! FRENCH FRIES! 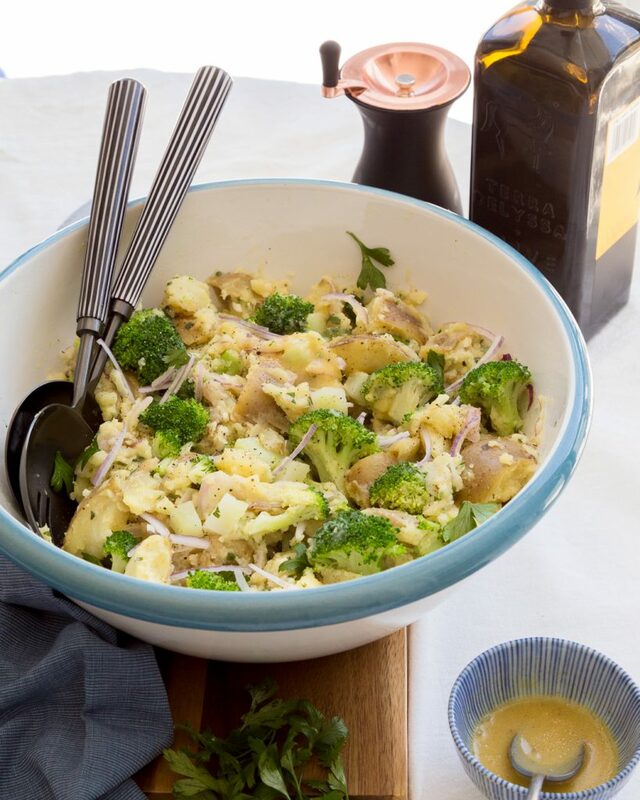 The dish’s culinary roots may lie in a mix of Peruvian and Chinese cuisines. On the one hand, Lomo Saltado uses quintessentially Peruvian ingredients, such as lomo (beef tenderloin), potatoes and aji amarillo. On the other hand, it is made with soy sauce, often served with white rice and uses Chinese techniques, namely stir-frying in a wok. The blending of the two cultures is often referred to as Chifa. However, as far as I’m told from Peruvians, Lomo Saltado has been around for so long that it’s become part of everyday Peruvian cooking and Chifa has become a standalone cuisine. Regardless of the cultural origins, Lomo Saltado is a fantastic dish that everyone should try! Lomo Saltado is a great entry point to Peruvian cooking. It’s quick, easy to prepare, remarkably tasty and requires only a few ingredients, most of which are readily available. The most difficult ingredient to source will likely be the aji amarillo paste. This yellow chili pepper is often blended into a condiment and stirred into various sauces. It is also commonly used fresh. I have to admit that I was unable to find the paste in Toronto but I haven’t given up hope! In the meantime, I decided to use a Mexican habanero salsa. I realize this may offend some but at the same time I think there is a case to be made for unavoidable substitutions. After all, if we’re being fair, by definition fusion cuisine opens itself up to just about any number of variations. 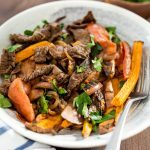 Perhaps the best part of Lomo Saltado is how easily it can be made Paleo and Whole30 compliant. 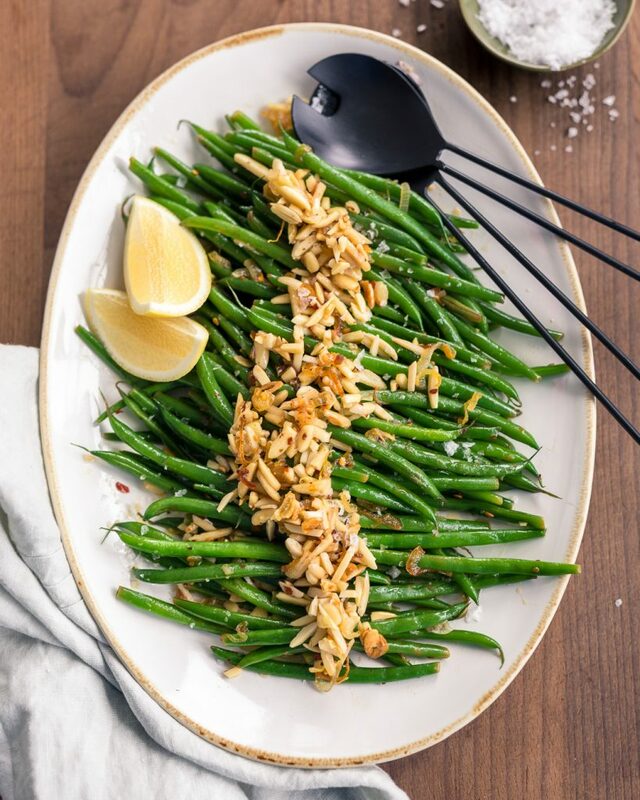 First and foremost, coconut aminos can be used in the place of soy sauce. Secondly, regular potato French fries can be swapped out for sweet potato fries, if so desired. 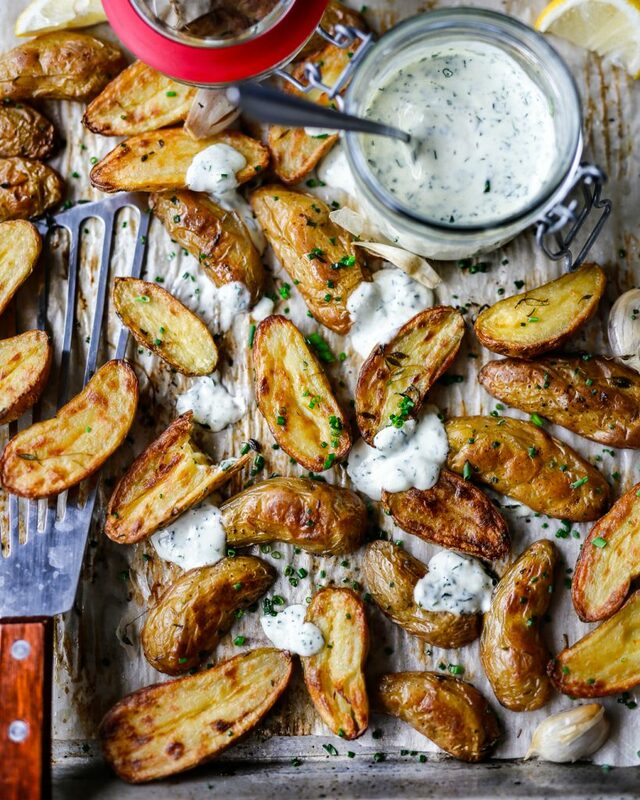 It should be mentioned that oven-baked fries made with regular potatoes would also be considered Whole30 compliant. I just happened to have a few extra sweet potatoes on hand and decided to use those instead. In fact, my wife and I really enjoyed the sweetness against the acid from the vinegar in the sauce. 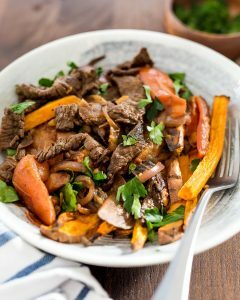 I hope you’ll give this Whole30 Lomo Saltado recipe a try. It’s as delicious as it is difficult to photograph! Preheat oven to 400F. 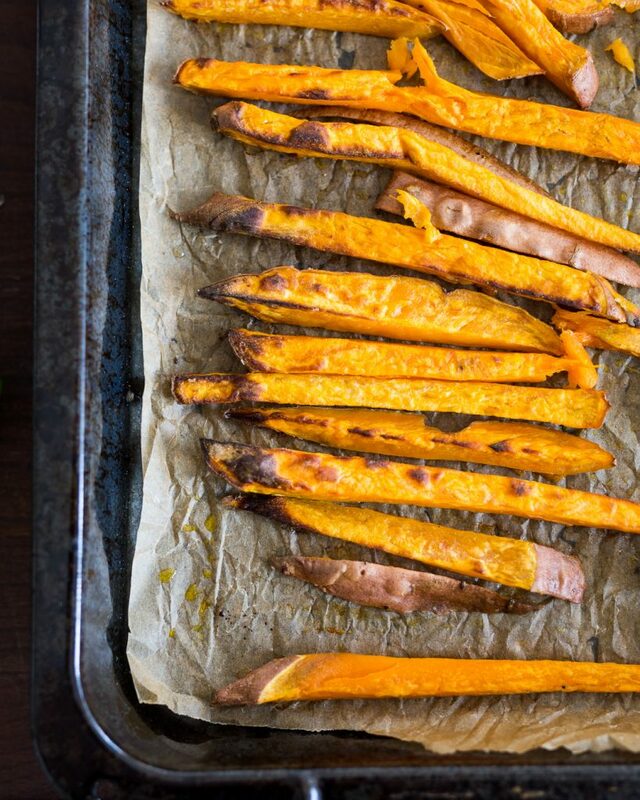 Place sweet potato fries on a baking sheet lined with parchment paper. Drizzle with 2 tbsp avocado oil and season with a pinch of salt. Toss to coat and arrange in a single layer. Transfer to oven and cook 30-35 min undisturbed, or until golden brown and fork tender. Meanwhile, add beef to a small bowl and pour in coconut aminos. Toss to coat and let marinade 15 minutes while you prepare the remaining ingredients. When ready to cook, drain beef from as much marinade as possible, reserving all of the liquid. Preheat a carbon-steel or cast-iron pan or wok over medium high heat for 5 minutes. Raise heat to high and add avocado oil. Carefully add drained beef to hot oil (it will splatter!). Use a spatula to evenly spread beef across the surface of the pan. Cook undisturbed 2-3 minutes or until the beef develops a crust. Stir-fry an additional 1-2 minutes. Transfer browned beef to a bowl and set aside. Lower heat to medium-low, add onion to the pan and season with a pinch of salt. Stir-fry 3-4 minutes or until onion is translucent. Add garlic and ginger and cook an additional 30 seconds. Add tomatoes, reserved beef marinade, rice wine vinegar and habanero salsa. Stir fry until tomatoes have softened (approximately 3-4 minutes). 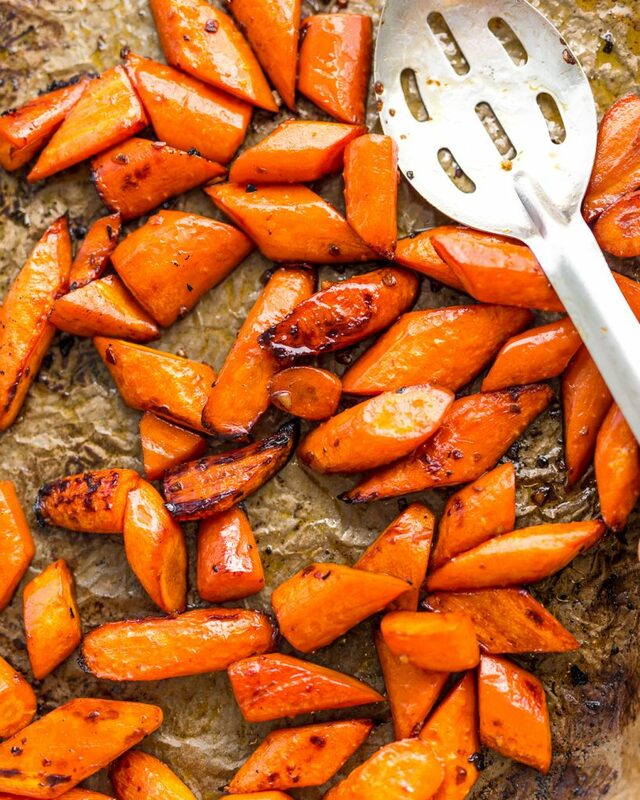 Return beef to pan along with ¼ of the sweet potato fries and toss everything to coat. Remove pan from heat and garnish with parsley. Toss everything to combine. 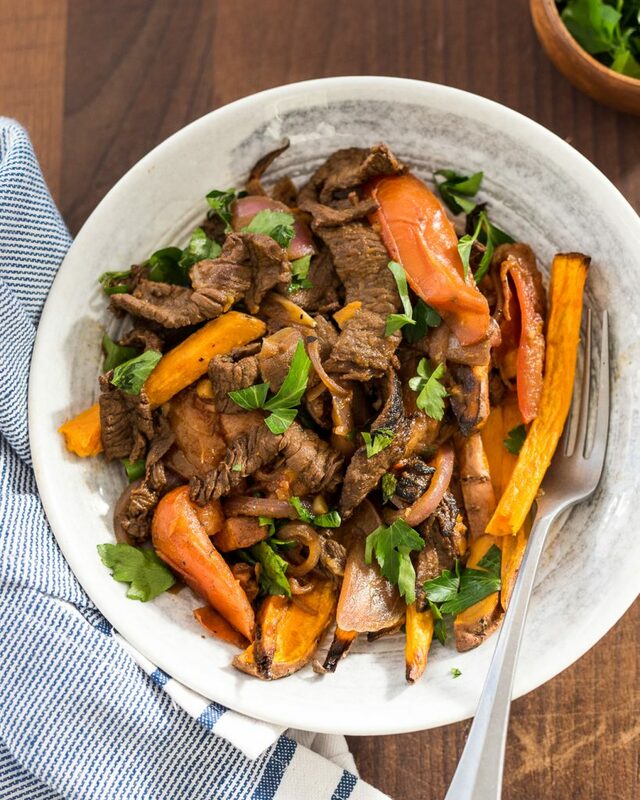 To serve, lay down a bed of the remaining sweet potatoes and top with Lomo Saltado. Garnish with a bit more parsley and enjoy immediately. 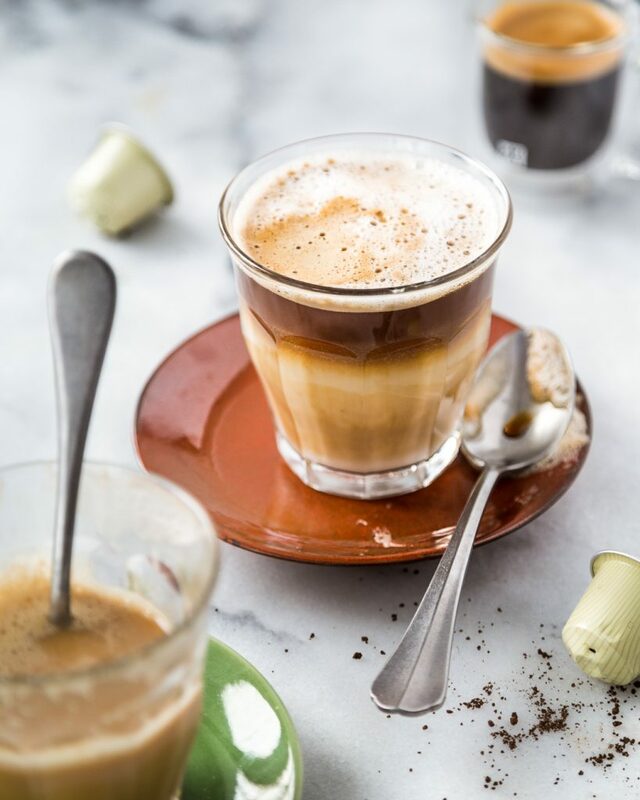 The post Dairy-Free Vanilla Latte Macchiato appeared first on Primal Gourmet. I wont’ lie, the coffee enthusiast in me really wants to bash these Dairy-Free Vanilla Latte Macchiatos. The fact is, they’re really delicious. So much so that I find myself craving them every now and then. You see, personally, I drink my coffee black. No exceptions. My wife, Catalina, on the other hand claims that she CANNOT drink coffee unless it has some sort of milk in there. Up until two years ago, she was pouring about a gallon of dairy in her coffee per week. It took me the better part of about 4 years to wean her off of dairy and get her onto dairy-free options such as different types of nut milks (almond, cashew, coconut, etc). Believe me, it was a hard-fought battle but in the end she came around to see the harmful side effects dairy was having on her body. Things like headaches, inflammation, constantly getting sick and taking weeks to recover from a common cold, were all minimized after she quit dairy. This, of course, came in tandem with a more thoughtful approach to food in general and cutting back on sugar, wheat, legumes, and alcohol. Her go-to cup of morning brew these days is much different than it used to be because of the new addition to our family. While Catalina was pregnant with Sofia she cut back from about 3 very large cups of coffee a day to only one and it was about a half-cup at that. The rest of the cup was, of course, filled with almond milk. 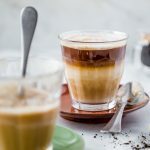 I’ve been whipping up this dairy-free latte macchiato for her on the weekends as a special treat and somewhere along the way I found myself enjoying one or two as well. It’s a really simple beverage that doesn’t necessarily require any fancy equipment. Of course, it is made much easier with an espresso machine and milk frother. What Makes this a Dairy-Free Vanilla Latte Macchiato? First and foremost, the exclusion of dairy and the inclusion of vanilla. Other than that, as far as I am aware, this is technically a latte macchiato because of the milk to espresso ratio as well as the fact that I pour the espresso overtop of the milk and thus create a layered beverage. If, on the other hand, I was to pour the milk overtop of the espresso, that would make it a latte. On the other, other hand, if I was to pour only a little steamed milk over the espresso it would be a macchiato (also called cortado). I have had my Nespresso Pixie for years and it’s still a very much beloved piece of kit. It doesn’t take up much counter space at all, pumps out a decent espresso, is easy to maintain and requires very little cleanup. The pods are fully recyclable and Nespresso has simplified the process by issuing pre-posted bags that you can simply drop in the mailbox with all your used pods. It’s a closed-loop, eco-friendly system. I know, sounds like an advertisement but I assure you, it isn’t. If you don’t have an espresso machine of any kind, you can make a cup of stovetop espresso using a Bialetti Moka. Of course, you could also just make a regular cup of coffee if that’s all you have. As for the milk frothing, this dairy-free vanilla latte macchiato tastes best when you “steam” the “milk”. Come to think of it, I’m not sure it can technically be called a latte or macchiato unless the milk is steamed. I own the original Nespresso Aerrocino, which is a fine device and works wonders. The newer version is essentially the same but with a design revamp. My milk frother is currently on loan with my parents for the time being so I had to devise a different method for steaming the milk (in this case almond milk). To do so, I simply heat the almond milk in a small sauce pan over medium-low heat until it starts to steam. Then I use a bamboo whisk to continuously whisk the milk until it develops a layer of froth on the surface. Another trick is to steam the milk in a sauce pan, transfer it to a clean French press and agitate the milk with the plunger until it froths. This will introduce much more air into the milk than a whisk alone. The vanilla flavour in the latte macchiato is introduced first and foremost by the dried vanilla beans I use. These were sent to me from Bulletproof a while ago. It seems they’ve discontinued the product, which is a shame because it’s a great pantry addition. The second layer of vanilla comes from the vanilla-flavoured Nespresso pods. You don’t have to sweeten this beverage if you don’t want to. That choice is obviously yours to make. However, if you do want to sweeten it I find that a touch of agave syrup works wonders. I add it directly to the saucepan along with the milk as it heats up. That way it easily dissolves into the drink. If agave is unavailable, you can use honey or maple syrup. All options are delicious and will impart different flavours. I find agave to be more neutral, which is nice because it doesn’t overpower the vanilla flavours. Add almond milk, vanilla bean and agave syrup to a small sauce pan. Heat over medium-low until the milk starts to steam. Use a bamboo whisk or balloon whisk to beat the milk until it froths. Pour milk into individual mugs. 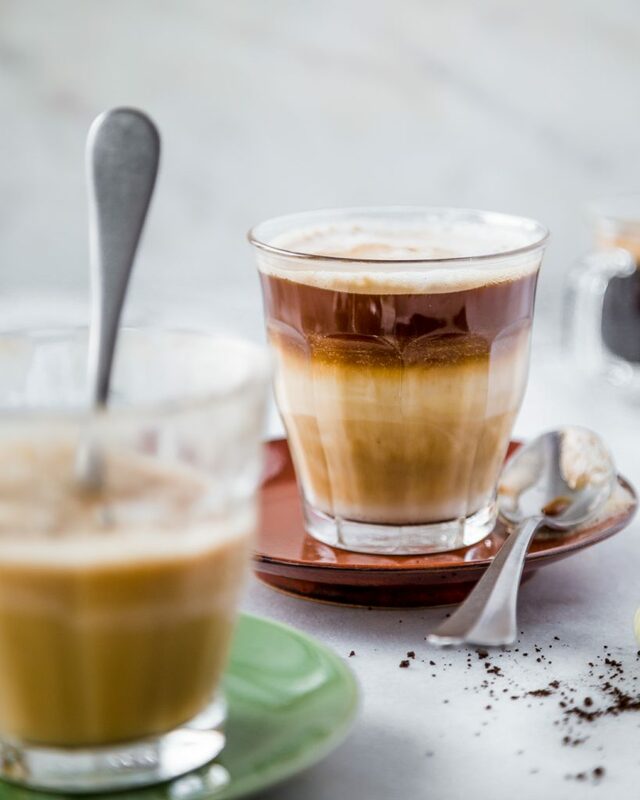 Pour espresso overtop of milk to create a latte macchiato.